Why Does Gold Give You Bruises? This is probably not something that I should be advertising on the general interweb, but I have some serious gold. 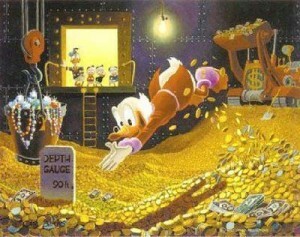 Not like, Scrooge McDuck goes swimming gold. But I have a 1910 gold sovereign from England, strung on a gold chain. My grandfather gave it to my grandmother and now I wear it. Not because I’m fancy, but because I’m sentimental. Also because it makes me feel a little like a pirate. Anyway, yesterday I took the necklace off and there, on my chest, was a dark greenish-black blotch which would not wash away. I would have written this off as a mysterious bruise, were it not the same shape and size of my doubloon. Because I know the gold is real [trust me, my grandmother mails me a facsimile of the insurance appraisal bi-annually] I had to ask Google: “Why does gold give you bruises?” If you believe old wives’ tales, or ehow.com, I am highly anemic. I guess it’s time to pump up the iron.